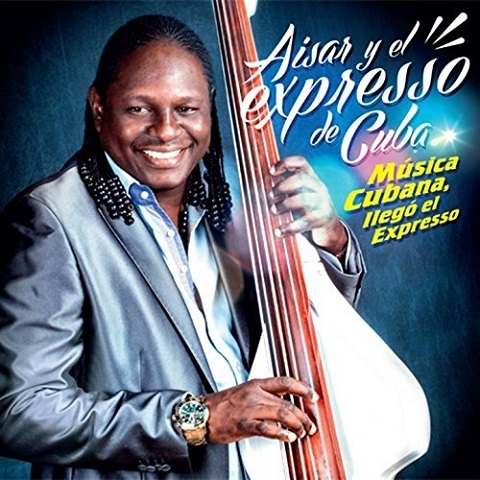 "Música Cubana, llegó el Expresso" is Aisar Hernández' first album as director of his own orchestra, Aisar y El Expresso de Cuba. Although timba fans know him best for his ten years as bassist and musical director of Elito Revé y Su Charangón, Aisar also worked with Orquesta Maravilla de Florida, Dan Den and Charanga Latina among other groups. As director of his own band Aisar has created his own sello, reconnecting with aspects of the Cuban traditional dance music heavily rooted in son and guaracha, but with a modern interpretation. The result is an album that appeals to timeberos and salseros, as well as those who just like to listen to Cuban music. "Música Cubana, llegó el Expresso" contains eleven tracks. All arrangements are Aisar's and six of the compositions are his. See below for the full credits . Songs such as "Llegó el expresso" and "Ahora es cuando es" are the obvious dance hits and refer to the band, the former being the band's mission statement — showing the people the essence of my country and the rhythms there now , and the latter being the strongest timba track on the album. "La manteca" and "El patio" are both excellent examples of the tradition of using double entendre to broach risqué subjects. "El son del dinero", "La tía" and "El solar" all paint aspects of Cuban everyday life. There are three romantic songs: "Cuando beso tu boca", the lovely duet "Amor oculto", and "No me canso". In a class by itself is "Tú me propones" featuring Akaena Rodríguez (Caribe Girls). Akaena has a rich alto and moves well between backing harmonies, a sweet duet and the more agressive vocal style in "Tú me propones" where she is letting her partner know that he needs to straighten up his act or get out. It is exciting to see another female singer rising in the male dominated contemporary Cuban dance music scene. Winner at Cubadisco 2017 in the Dance Music (New Talents) category , "Música Cubana, llegó el Expresso" is a strong debut album that succeeds in all it sets out to do, offering an unmistakably Cuban sound taking from best traditions of Cuban dance music but with a modern expression that reflects the tastes of dancers today. Eric Eduardo Broche Vidal "El Chino"
2 La manteca Geosvany Bárbaro Nelson Calistre Eric Eduardo Broche Vidal "El Chino"
7 Amor oculto Aisar Hernández Segundo Eric Eduardo Broche Vidal "El Chino"